Pictured is my dog Piglet at age 15. Piglet had severe degenerative joint disease in both elbows. See the link to Piglet's Story below for how I managed her condition and kept her mobile for 17 years. The number of things you can try to help your dog with arthritis can seem overwhelming, so I'm going to suggest some ways to get started. 1. WEIGHT & DIET One of the best things you can do for a dog with arthritis is to keep him lean. Ideally, your dog should be quite lean, with ribs easily felt but not hip or backbones protruding. If your dog is at all overweight, start him on a weight loss program right away -- note that traditional high-carbohydrate weight loss products are not recommended. See my article on Weight Loss Diets for some guidelines on helping your dog to lose weight. Also see the section below on Supplements and Diet Guidelines for dogs with arthritis for more information, and the section on Senior and overweight dogs on my Commercial Dog Foods page. If possible, reduce the amount of grains and starchy carbohydrates in the diet and increase the amount of protein. This can be done by feeding a better quality food, by using canned instead of dry foods, by adding fresh foods such as eggs and meat to the diet, or by feeding a home made diet. Many arthritic dogs improve when grains are removed from the diet, but if this doesn't help your dog, you don't need to continue to avoid them. Moderate exercise can also be good for dogs with arthritis, and can help with weight loss. See Exercise and the Treatment of Arthritis for more information. 2. GLUCOSAMINE I think all dogs with arthritis or known joint problems should be on some sort of glucosamine-type therapy. This should include oral supplements that contain glucosamine (sulfate or hcl), chondroitin sulfate, green lipped mussel (perna canaliculus), hyaluronic acid, or a combination of these. It may also include the injectable form, Adequan or Cartrophen. Since these supplements are the only things that actually help protect the joints rather than just treating the symptoms, they are a must for all dogs with joint problems. Different dogs respond differently to different supplements, so find one that works for your dog rather than relying on what has worked for others, though that may be a good place to start. Give high doses at first, so you will be able to tell if it is working. If you get results, you can try reducing the dosage to see if your dog will do well on less. If you don't get results, try a different brand. See Glucosamine and other GAGs for more information. 3. FISH OIL If I were to suggest any single nutritional supplement for dogs with arthritis, it would be fish oil (fish body oil, such as Salmon Oil or EPA oil, not cod liver oil). Fish oil provides omega-3 fatty acids that help reduce inflammation. They are beneficial no matter what type of diet you feed. Note that omega-3 fatty acids are fragile and break down quickly when exposed to light, heat or air, so just feeding a food that has omega-3 fatty acids added may not be helpful. Give as much as 1000 mg fish oil (300 mg EPA/DHA) per 10 lbs of body weight daily. Because fish oil depletes vitamin E in the body, you should also give vitamin E supplements whenever you supplement with oils of any kind. See Vitamin E for my current recommendations on vitamin E supplementation. See Fish Oil (Omega-3 Fatty Acids): a Proven Treatment for Canine Arthritis for information on two studies published in the JAVMA in 2010 showing how dogs with arthritis improve when given fish oil supplements. 4. PAIN RELIEF If your dog is in pain, look for ways to relieve it naturally before turning to NSAIDs. DLPA is the first thing I would try, it made a definite difference for my dog and is very safe to use. For worse pain, consider using Tramadol, a synthetic narcotic that can also be used in conjunction with NSAIDs (Update: New study shows Tramadol doesn't help with arthritis pain, may be too short-acting to provide much benefit for chronic pain.). I would also be trying a variety of natural anti-inflammatories, to see if any of them seem to make a difference. I'm always trying something new with my Piglet. If one supplement doesn't seem to help, I simply move on to another one when I run out. Anything that does seem to help I continue using. See the section on Chronic Pain Relief for more information on drugs used to help dogs with arthritis pain. 5. ALTERNATIVE THERAPIES Many people have reported success using acupuncture for arthritis. Unfortunately, I am not one of them, and at least in my area, acupuncture is very expensive (over $100 per visit), so it's not the first thing I would recommend trying unless you have access to it at a more reasonable rate. If your dog does respond to acupuncture, you can also consider gold bead implants, which are a form of permanent acupuncture. Chiropractic can also be helpful in many cases, although again, I have not had success with it myself. I do not recommend VOM (veterinary orthopedic manipulation), a form of chiropractic that makes unrealistic claims and in our case had no benefit at all, but other forms may be very helpful for many dogs. I am not a believer in homeopathy, but some people have reported success using homeopathic remedies for arthritis pain, including Zeel and Traumeel. My dog Piglet (whose picture appears at the top of this page) had surgery for elbow dysplasia on both elbows before her second birthday, followed by surgery for a ruptured cruciate at age 3. She was on daily Rimadyl/Etogesic with occasional doses of prednisone up until age 7. At that time, I switched her to a raw, grain-free diet with natural supplements. She improved so much that I was able to discontinue all medications. At age 10, she ruptured her other cruciate and again had surgery (April, 2002). It took about three months for us to build back up to her usual 2 mile daily walks, but she did extremely well, became just as active as ever, and was still on no medications for her arthritis, despite the fact that x-rays confirmed severe degenerative joint disease in both elbows. At age 11, she became lamer in one elbow, and after many months of struggling to get her back to where she had been before, I put her back on NSAIDs (Metacam). She continued to be slower than before and I had to cut back on walks because she couldn't go as far. After about a year, she improved again, and while still slower than she used to be, could go on full length walks again at age 13. Then I discovered a very small tumor in her foot, between her toes. It was removed immediately, and when she recovered, she began taking very long walks, longer than ever before. Now, at age 14, she walks 1 1/2 to 2 hours at a time, going sometimes 3-4 miles, almost every day. I suspect that the tumor had been bothering her to walk on. It never hurts to keep looking for other possible causes of lameness, even when you know your dog has bad joints. First, I feed a raw, grain-free diet. I also weigh all her food using a small postage scale, originally to gradually reduce her weight and now to maintain it (she weighs about 33 pounds and is lean but not skinny; she weighed 36 pounds at the age of 10 months and has been as high as 42 pounds). Keeping dogs with arthritis lean is one of the best things you can do to help them. Also, grains tend to increase inflammation and aggravate arthritis. Many dogs improve when grains are removed from the diet (most dry foods are high in grains, though there are a number of grain-free foods being offered, see my Dry Dog Foods web page for more info; note that there are also some canned foods that are grain free). I give fish oil(body oil, not liver oil), Vitamin E (which should always be given when supplementing oils; see Vitamin E for my current recommendations on vitamin E supplementation), and antioxidants, usually Cell Revive 880 (same as Cell Advance 880) or sometimes Thorne Veterinary Immugen. I also give a Vitamin B-50 complex daily -- note that niacinamide (a form of vitamin B3) has antioxidant and anti-inflammatory properties, and may help to rebuild cartilage. According to a vet who recommended it to me, the dosage for Piglet's size (35 lbs) is 50 mg, which is what I get in the B-50 vitamin complex that I use. See Nutrition Q & A (scroll down to the last question) for more information on niacinamide. It is important that dogs with arthritis get adequate, but not excessive amounts of calcium, vitamin D and magnesium. If you are feeding a commercial diet, there should be no need to supplement with any of these. If you are feeding a home made diet, it might be helpful to supplement with small amounts of vitamin D (such as from cod liver oil) and magnesium. If your diet includes raw meaty bones, they should not account for more than around 50% of the diet. If your diet does not include bones, then you need to add calcium at the rate of around 1000 mg per pound of food (1/2 teaspoon of ground eggshell yields about 1000 mg of calcium). Piglet gets raw meaty bones as about half of her diet, and I have not been supplementing with magnesium or vitamin D.
I have rotated among Yucca Intensive, Bromelain, Quercetin, Boswellia, Turmeric (or its extract, Curcumin), Sam-E, Borage Oil and other natural anti-inflammatory herbs and Nutraceuticals. It is difficult for me to tell how much any of these have helped, but I believe all have had some benefit. Note that Bromelain is most effective when given away from meals for an anti-inflammatory effect (otherwise, it is used for digestion), and may work best when combined with Quercetin. See Natural Anti-inflammatories for more information. Piglet also gets fresh crushed raw garlic (one small clove per day, as too much can be toxic), alfalfa, organic (raw) apple cider vinegar (about half a tablespoon daily) and fresh raw ginger in her food, all of which may help with arthritis. Before starting Piglet on Metacam, we used Willow Bark instead of Aspirin for occasional pain relief when she overdoes it, as it is easier on the stomach. You can also use aspirin buffered with an antacid such as calcium carbonate, aluminum hydroxide, and/or magnesium hydroxide. Giving with food may help prevent stomach upset, but not ulceration. Do not combine Aspirin with Willow Bark or any NSAID, such as Rimadyl or Etogesic (see the section on NSAIDs in my Chronic Pain page for more information). Also, do not use enteric coated aspirin, which can be dangerous for dogs. Piglet got something called DogLeggs for Christmas. They keep her elbows warm and padded at all times. They appear to be comfortable, she wears them all of the time except when we go on our walks and during the day when it is hot, and she seems to enjoy them. 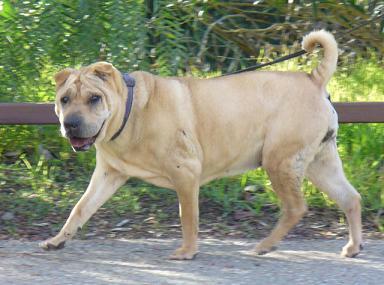 July, 2008: Piglet is now 16 1/2, an amazing age for a Shar-Pei. She remains quite healthy and still enjoys her walks, but continues to be very slow. I've decided to try Pulsed Signal Therapy (PST) in the hopes that it will help her be able to go further. I stopped giving Piglet Arthroplex, as she has high blood pressure and the DLPA it contains can make that worse -- her kidneys and heart are fine, but she has some corneal degeneration and pigmentary keratitis that interfere with her vision, and I was afraid that she might blow out her retina due to the high blood pressure (she's also now on blood pressure medication). I first tried Dasuquin as a replacement, but she seemed a little worse on that, so I switched to Sea Mussel Plus and I've been happy with that. I also added three anti-inflammatory supplements in the hopes it might make enough difference that she would not need PST, but no such luck -- she may be a little better, but not a lot. The new supplements I added were Microlactin, Boswellia, and a combination Bromelain and Quercetin (I get all of these, including Sea Mussel Plus, at vitacost.com). That's in addition to her usual supplements of fish oil, turmeric (curcumin), SAM-e,CoQ10 and a multi-vitamin, and her usual medications, Metacam and Tramadol. Piglet starts PST next week, going every day for 9 consecutive days. I will update this site if I notice any improvement. October, 2008: Piglet has continued to be quite lame. The pulsed signal therapy (PST) did not help her at all. I tried switching her from Metacam to Previcox, which seemed to help but upset her stomach. I then tried prednisone, which helped a lot, but not being sure it was necessary, I tried another new NSAID, Zubrin. This one she tolerated well, but she returned to being quite lame. I've since switched her back to prednisone, which she is likely to remain on for the rest of her life. At almost 17, I don't have major concerns about its long term effects. Her dosage is every other day, which is also supposed to decrease side effects. Note that I kept her off all drugs for 72 hours in between each change in medication, as it's dangerous to switch from one NSAID to another, or to pred, too quickly. January, 2009: Piglet is now 17. She is doing well on the prednisone; although still favoring her right elbow, she is able to take long walks again, averaging around an hour a day, though she is very slow. I have discontinued all her other supplements, as it's unlikely that any natural anti-inflammatories would add anything over and above what prednisone provides, and she's developed some digestive problems that seem to do better when she's not getting supplements. March, 2009: Piglet is gone. She went downhill sharply in the last few weeks of her life, developing dementia and unable to cope with her limited vision. She was still mobile to the end, though very slow. She had a wonderful life, far longer than I ever dreamed when she was diagnosed with elbow dysplasia at a year old. Her condition helped me find the path to a natural diet and supplements, and to learning more about dog health and nutrition. She will always be in my heart. From the age of 7 to 11, Piglet was in better shape with no medications than she had been at a younger age, and she did not slow down much at all. At age 11 1/2, her left elbow became quite a bit worse, and she began slowing down. In general, she has been very active and fit, but our walks decreased from an hour a day, to half an hour a day, down to 15 minutes on bad days, at age 12 1/2. She then improved again (I think she had injured her left elbow and it gradually got better), and at age 13, she went back to about 45 minutes a day. At age 14, following surgery to remove a small tumor, she began taking longer walks than ever. She slowed down again at age 15, but then gradually improved following shock wave therapy. Moderate exercise is good for dogs with arthritis, as long as you don't overdo it (tired muscles make for lax joints, which is not good). There are email lists called OrthoDogs and CanineHD at Yahoo Groups that offer additional information about surgery for joint problems. Also see AbleDogs and Dodgerslist for dogs with back problems. There is a list called TPO that talks about surgical options for hip dysplasia and cruciate ligament repairs (also see the site at http://www.lauriebryce.com/tplo/ for a great deal of information and links about orthopedic surgery). Note I am not advocating TPLO surgery for cruciate ligament injuries (and that is not what I had done on Piglet) -- it works well for some dogs, but I've heard of others where the joint doesn't heal properly and the dog is worse off than before. The skill of the surgeon may be a factor. Strict activity restriction is required, and failure to do so may contribute to complications. I have also heard reports, both directly and indirectly, of dogs developing bone cancer following this surgery, as well as other long-term complications. Removal of all implants six months to a year following the surgery may help to reduce this risk. I would seriously consider TPLO surgery for large, active dogs, but probably not for smaller or less active dogs, for whom conventional surgery seems to work well. See TPLO Awareness for more information. Also see Tibial Plateau Leveling Osteotomy - TPLO for a good overview. There are other forms of leveling osteotomies available as well, such as TTA (tibial tuberosity advancement). See TPLO vs. TTA for Cranial Cruciate Ligament Repair and Cranial cruciate ligament injuries in dogs—where to go next? for more information. MSU began offering arthroscopic cruciate ligament (knee) surgery for dogs in 2007. This is combined with traditional cruciate repair, involving sutures to stabilize the knee. One Pro’s Take on Orthopedic Advances (quotation from a surgical specialist in November 2012): "When I came to OSU 19 years ago, TPLO surgery for cruciate disease was just starting to be talked about. Cruciate repair was mostly done by lateral suture, essentially mimicking the action of the anterior cruciate ligament,” Rochat recalled. “Cruciate repair surgery is now largely TPLOs. Another procedure, tibial tuberosity advancement, is a new alternative that is purported to be easier to do, with fewer complications, yet the evolving literature doesn’t totally support that. “Nevertheless, while the general subjective experience is that TPLO works very well, what little objective science there is still leaves us questioning that,” Rochat continued. “Properly done, a lateral suture stabilization technique [the older style of cruciate surgery] can yield good results. Again, the quest for accurate, unbiased evidence for the best solution for cranial cruciate ligament disease continues." If your dog has orthopedic surgery, there are a couple of things you should be aware of that your vet may not be current on. The first is pain management, see my my section on Pre- and Post-Op Care for more information (I also have links at the bottom of that section to braces, slings and carts). Also ask about using intra-articular injections of either bupivacaine or morphine during surgery, which has been shown to provide more pain relief in the first 24 hours after surgery (see Postoperative analgesia for stifle surgery: a comparison of intra-articular bupivacaine, morphine, or saline). A newer option is Nocita, a long-acting local anesthetic using extended-release bupivacaine that provides up to 72 hours of pain relief following cruciate surgery. The second is that recent research shows that it is important to start doing physical rehabilitation right away, at least in the case of knee surgery, rather than waiting six weeks. Contact me privately if you want a copy of the rehab instructions the surgeon gave me when Piglet had her second knee surgery in 2002. See The American Association of Rehabilitation Veterinarians to locate a rehab specialist in your area. Also see Physical Therapy for Pets for an overview of how important this type of therapy can be following an injury. Conservative management may be tried in place of surgery if your dog has a cruciate ligament (knee) injury. If no improvement is seen within six to eight weeks, you should then move on to surgery. It is imperative that activity be limited during this time. It is my opinion that a ruptured cruciate will do better with surgery than without, but if there is any doubt about the diagnosis (which cannot be done via x-ray alone), then it may make sense to wait. As long as activity is restricted, no harm should come from waiting for up to two months. See Treating Canine Ligament Injury Without Surgery for more information. Also see How to Confirm Partial ACL Tear for some technical information on how vets try to confirm ACL injuries and differentiate between hip and knee pain. There is a Yahoo Conservative Management group for discussing this option with others. Consider a custom stifle (knee) brace to help protect the knee and prevent reinjury during the recovery period (see Braces, Splints, Orthotics and Prosthetics for more options). Also see 10 Deadly Sins of Untreated ACLs for one veterinary surgeon's arguments in favor of surgery. Changing Views On CCL Repair, written by a well-known vet who practices "Integrative Pain Medicine and Natural Healing," talks about the use of Prolotherapy for treating cruciate ligament laxity (looseness), but I don't know whether it would help with a torn ligament, and it's hard to find a vet who does it. Also see Questioning Canine Cruciate Ligament Surgery, by the same author, which presents a hodgepodge of arguments against surgery, though the information is scattered and appears to apply primarily to TPLO, not other forms of cruciate ligament repair. For example, she says, "about half of Labradors rupture the contralateral CCL [cruciate ligament in the opposite leg] within six months after tibial plateau leveling osteotomy [TPLO]," but she does not compare this to rates of injury for other forms of therapy, which makes the statistic meaningless, at least in terms of trying to decide between treatment modalities. The same author collaborated with others on a third article, Treatment Options for Canine Cruciate Disease, which supports surgery in most cases, particularly for dogs over 15 kg (33 pounds), but also suggests laser therapy, acupuncture, and other modes of physical rehabilitation either after surgery, or in place of surgery if surgery cannot be done (see Other Therapies for more information on these modalities). See Other Therapies for more information on rehabilitation following injury or surgery. Also see Post Surgical Aids for information on a variety of devices that may be helpful, including e-collar alternatives, slings, braces, support harnesses, and more. Orthopets, a maker of custom braces and other orthotics, in particular has had success treating ruptured cruciate ligaments without surgery (more info under Braces, Splints, Orthotics and Prosthetics). The University of Florida performed its first total knee replacement surgery in a dog in 2012. They are seeking additional dogs with severe osteoarthritis in the knee for a clinical study on total knee replacements for dogs. See First canine total knee replacement at University of Florida a success for more information. There's More Options for Bad Joints in Aging Pets Overview of treatments. Animal Joint Care 101: Does Your Pet Have an Arthritis Treatment Checklist? Good overview on arthritis. Nutritional Management of Canine Osteoarthritis (Denise Elliott BVSc (Hons), PhD, Dipl. ACVIM, Dipl. ACVN, Eric Servet, MEng, Vincent Biourge, DVM, PhD, Dipl. ACVN, Dipl. ECVCN), Encyclopedia of Canine Clinical Nutrition. Studies showing how PUFAs (fish oil), antioxidants and various oral chondroprotective agents (green-lipped mussel, glucosamine and chondroitin) help with arthritis pain. Physical and Alternative Therapies in the Management of Arthritic Patients (Serge Sawaya, PhD) Talks about use of heat and cold therapy, therapeutic ultrasound, neuromuscular electro-stimulation, shock-wave therapy, osteopathy and acupuncture. My dog Piglet had elbow dysplasia (fragmented coronoid process) and had surgery on both elbows at the same time shortly before she turned two years old. The surgery was just to clean out the joint; nothing more could be done at that time. In later years, when I talked to orthopedic surgeons about treatment options, they said that total elbow replacement was not a possibility because of Piglet's size (she weighed about 35 lbs), and that repeating the cleaning-out surgery would not benefit her enough to make up for what she would have to go through during recovery. The only other option would have been arthrodesis, where they fuse the joint together, preventing it from moving. This leaves the dog with a limp, but the joint is no longer painful. I did not pursue this option, as I was able to keep Piglet mobile and relatively pain-free well enough with weight control and medications until she was quite old. Series 6/Episode 2 "Orla, Scooby, and Kate" dated March 2016 talks about a partial elbow replacement done on a Labrador named Scooby, described as follows: "The inner half of the cartilage lining of Scooby’s elbows has completely worn away, causing painful bone-on-bone grinding whenever he walks. Noel replaces the inner half of the first of Scooby’s elbow joints using metal and plastic implants that are embedded into the bone leaving a smooth and pain-free joint surface. Series 11/Episode 1 "Teddy, Harvey and Juke" dated February 2018 talks about a partial elbow replacement done on a Labrador named Juke, described as follows: "Juke would need partial elbow replacements to relieve the pain. . . . Jukes elbows would be replaced one at a time, giving him time to recover from each separately. The implants were carefully designed and custom-made to fit Juke’s bones exactly. Once in theatre, Noel placed pins into the humerus and the ulna bones using a drill guide. The pins would ensure that the implants could be placed in precisely the right spot, with enough supporting bone left around them. A smooth metal surface was implanted into the humerus and a special plastic surface was fitted into the ulna, to replace the diseased portions of joint surface that had been causing Juke pain. Each new surface was incorporated into a special metal backing plate that would allow the surrounding bone to grow into the implant over time. The surgery went according to plan and Juke was sent home 4 days later to convalesce. It is unclear whether this procedure is available in the U.S. or from any vet other than Dr. Fitzpatrick. It is bound to be quite expensive, requiring a CT scan and custom implants. There are many causes of elbow dysplasia and this procedure would only be applicable to certain types. See Prof. Fitzpatrick's website on Canine Elbow Dysplasia for more information. THE FIRST 2 YEARS OF CUE – IS UNICOMPARTMENTAL ELBOW RESURFACING WORKING?